TV show dates: November 14, 2017 — TBD. Performers include: Josh Hutcherson, Eliza Coupe, Derek Wilson, Glenne Headly, Ed Begley Jr., Robert Craighead, and Jason Scott Jenkins. A time travel comedy, the Future Man TV show centers on Josh Futterman (Hutcherson). Josh hasn’t amounted to much in the real world. Due, in part, to adolescent infirmities, Josh is lacking in social skills. With pretty much zero confidence, he is deeply uncomfortable around women. He also still lives with his parents and works as a janitor at an STI research center, Kronish Labs. Any “success” Josh has attained is in the realm of gaming. He is the top-ranking Cybergeddon player in the world. When he finally beats this supposedly “unbeatable” game, he is visited by Cybergeddon characters who explain the game is actually a training manual. Now that he has mastered it, it is up to him to travel back in time and save the world. Josh’s parents Diane and Gabe (Headly and Begley) are well-meaning potheads. Diane still takes care of her son — to his detriment. Her cooking, cleaning, doing his laundry and otherwise indulging him removes any incentive he might have to strike out on his own. Likewise, Ed is always trying to find ways to make Josh feel better about himself. The excuses he makes for Josh’s shortcomings, although well meant, aren’t helping his son grow up and get a grip. Meanwhile, Tiger (Coupe) and Wolf (Wilson) are futuristic Cybergeddon soldiers. When Josh beats the final level of the game, they reach out from their nightmarish existence, to recruit him to help save the world. Tiger has her hands full. Where Josh is something of a bumbling fool, Wolf is an out of control freak who is no longer affected by either violence or basic human feeling. Although he is loyal to Tiger, Wolf does not believe Josh is capable of completing his mission. For her own part, Tiger is as strong and intense as she is hot, in both appearance and temper. Trying to keep her challenging charges focused on their mission is difficult enough, but she also has a secret that could change everything. Will Tiger and Wolf get it together and follow Tiger’s lead? Can this unlikely trio really save the world? Stay tuned. What do you think? Do you like the Future Man TV series? Should this TV show be ending or be renewed for a fourth season on Hulu? 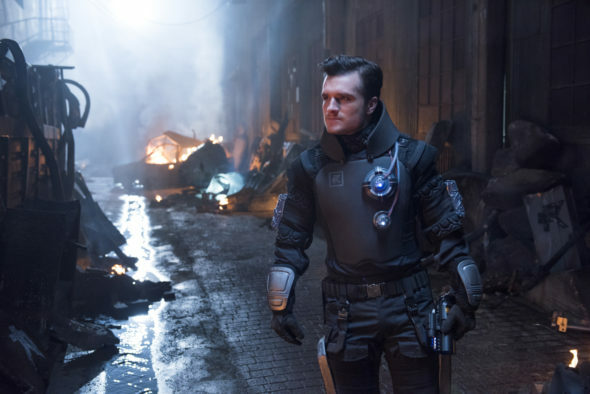 More about: Future Man, Future Man: canceled or renewed?, Future Man: ratings, Hulu TV shows: canceled or renewed? Future Man: Is the Hulu TV Show Cancelled or Renewed for Season Three? Future Man: Is the Hulu TV Series Cancelled or Renewed for Season Two? Hahaha this show everything! One of’the best comedy serie I’ve seen in years. It’s good but they do stretch things out too much. 13 shows could easily fit into 10 or less if they trim the excess fat. This would make it a more appealing binge watch show. Absolutely genius! Between this and The Orville, comedy science fiction TV is having a rare moment. Also, Josh Hutcherson is just so darned adorable. More please! As for being “raunchy”, yes there is adult humor and situations. As an adult, that’s great! I don’t need or want everything I watch to be so sanitized it is safe for first-graders. PLEASE DONT CANCEL THIS SERIES !! THAT IS ALL I HAVE TO SAY ! This show is THE funniest on TV. They go all the way for the joke which is so refreshing. Nothing is put through the political correctness filter or otherwise sanitized. A lot of the references may go over your head if you are under 30 but there is still a lot of entertainment there. Can’t wait for season 2 !!! Sadly found it dreadful in every way. Haven’t laughed that hard in a long time!